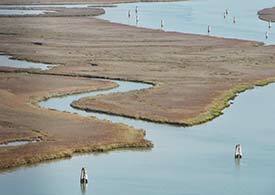 ABOVE: Low-lying land and channel markers on the island of Torcello. INSET BELOW: Bicycling along the litorale that separates the lagoon from the sea, bricole near the island of San Clemente, a navigation light, a shellfishing shack near Chioggia, and an ACTV water bus from Venice to Burano. Venice is among the world's most urban cities: a crowded aggregate of houses, palazzi, churches, squares, and other manmade structures, with few public green spaces to relieve a landscape dominated by stone, brick, and stuccoed walls. So much for the obvious. What most visitors don't realize is that Venice is surrounded by one of the most ecologically rich bodies of water in the Mediterranean: the Laguna Veneta, or Venetian Lagoon. The Laguna is a crescent-shaped body of water between the Italian mainland and the Adriatic sea. It lies within the arms of the Litorale Pellestrina, Litorale di Lido, and Litorale del Cavallino. These three strips of land are broken at only three entrances or porti along a length of some 30 miles (45 km), creating a marshy environment that is fed by rivers yet flushed by salt water from the Adriatic. "The flow of rivers and canals mingles with the wash of the sea, with the slow movement of the Adriatic tides, checked by peninsulas and sandbanks. The barene, those stretches that are now submerged, now emerging, sometimes appear to twinkle on the horizon below their fringes of weeds. The mysterious play of the currents, in a slow process of undermining, eroding, and filling, shifts the deepest basins and brimming lands, providential pastures for crab, shrimp, shellfish, octupus, squid, gulls, snipe, herons, wild ducks, shoveler ducks--all the incorrigible hunters and fishers. And I thought this was an inanimate realm." As Vitoux points out later in the same chapter, the Venetian Lagoon has an average depth of just two feet. Yet within that shallow depth are any number of creatures: anemones, crabs, mussels, limpets, barnacles, cuttlefish, squill, oysters, shrimp, and fish that range from the tiny anchovy to eels, mullet, and sea bass up to 30 inches (75 cm) in length. And because so much food is readily available, birds such as ducks, swans, cormorants, and spoonbills proliferate on the many abandoned or uninhabitable islands in the lagoon. Fish farming is a relatively new phenomenon in the North America, but the Lagoon's inhabitants have practiced vallicultura for centuries. Fish farmers create a maze of banked areas, with fish locks connecting the valle or ponds to the open lagoon. The fish locks, or dams, are opened at certain times of the year to admit fish, then closed until the fish are ready to return to the lagoon--at which time some are caught and others are released to grow or reproduce in their natural environment. Other sea creatures are caught in the wild by a variety of techniques. Tour the Lagoon by boat, and you'll see large square nets that are suspended from latticework towers. Fishermen lower the nets by hand when a school of fish approaches, then raise the nets to capture the fish. Mussel ropes are also visible in many places--just look for what appear to be soccer standards with ropes hanging from the wooden crosspieces. "If you keep very close to the bricole, you are usually safe; but not always, for sometimes their positioning is disconcertingly precise, and if you are a few inches on the wrong side--splosh, there you are again, up to your knees in mud, and pushing from the stern. There are said to be 20,000 bricole in the Venetian lagoon. Some are precariously rotting, and look as though generations of water-rats have nibbled their woodwork. "One or two have little shrines upon them, dear to the artists and poets of the nineteenth century ('Around her shrine no eartly blossoms blow, No footsteps frent the pathway to and fro'). Many are used by lovers, anglers and bathing boys as mooring piles for their boats: and one of the most curious sights of the lagoon is offered by those gondoliers who, to while away a blazing holiday, run their gondolas upon a convenient mud-bank and take their families paddling, leaving their queer-prowed craft gasping and stranded on the mud, fenced by the gaunt stockade of the bricole." ABOVE: A boat near the island of San Clemente. In earlier times, the Lagoon's marshy environment gave rise to malaria and other diseases. Today, the health hazards have done a turnabout: the threat is now from man to the Lagoon. Industrial plants at at Marghera, on the mainland near the causeway to Venice, has dumped chemical pollutants into the Lagoon over the last several decades. Increased traffic by tankers and other large ships has added to the problem. Agriculture deserves much of the blame for the algae that clogs the lagoon during the summer months, since rain often washes chemical fertilizers into the Lagoon. This is an especially severe problem in the marshy areas known as the laguna morta ("dead lagoon"), which aren't rinsed by the Adriatic tides. The Municipality of Venice is making efforts to reduce pollution, including the use of buffer strips to capture agricultural nutrients with trees and shrubbery along the edges of the Lagoon. Scientists are also trying to determine how a treatment plant might reduce nitrate and phosphate deposits in the lagoon. In the meantime, the Lagoon continues to suffer from increases in algae, mosquitoes, and other consequences of pollution by raw sewage, industrial discharges, laundry detergents, and fertilizer runoff. 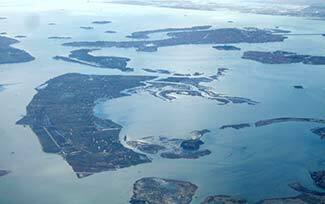 ABOVE: An aerial view of the Venetian Lagoon. If you fly into Venice, Italy's Marco Polo Airport and the weather is decent, you'll get a fascinating aerial view of the Laguna Veneta--including glimpses of brick houses and hunting lodges that sit on tiny patches of dry land at high tide. For a more intimate view of the Lagoon, take the Alilaguna airport boat from airport to the Piazza San Marco instead of a land bus or taxi, or go to Burano and Torcello on public transportation. Read our Venice Islands Tour article and see our Vaporetto Routes article to learn about water buses that serve the outer reaches of the Lagoon. Also see our article about Chioggia, a fishing port at the southern end of the Lagoon, which has an historic center with canals plus the modern beach and boating resort of Sottomarina.